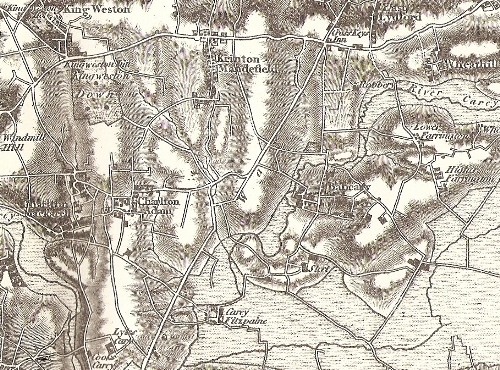 Walter Walter (1804-1877) lived at the 110 acre Greenhill Farm, Lower Foddington (Farrington), Babcary, Somerset (see right hand side of a more detailed map). According to the 1839 tithe records, he rented his land from Benjamin Greenhill, Esq. Walter was married to Ann Leach Penny (1814-1889) who was born in the neighbouring village of Charlton Mackrell, Somerset, the daughter of John Penny and Lucy Leach. 1. Mary Walter aged 21 is listed in the 1861 census at Greenhill Farm. In 1871 she is recorded as Mary Waller, a Visitor in the house of George Waghorn, a Lodging House Keeper in Tunbridge Wells, Kent, her occupation being a Domestic Servant. In September Quarter 1873 she married Worthing-born Edwin Oliver Locke (1842-1903) in Newcastle-on-Tyne District. More about the Family of Mary Walter and Edwin Oliver Locke. 2. Albert Walter aged 11 is listed in the 1851 census at Greenhill Farm. He emigrated to the USA, and died in the Civil War. More about Albert Walter - Illinois and the Civil War. 3. Caroline Walter aged 9 is listed in the 1851 census at Greenhill Farm. In 1861 she was living in Broad Street, Somerton where she was a draper's assistant at the shop of Joseph Williams (?on the corner of New Street - click the red New Street link on the Somerton Virtual Tour). Her grandmother Lucy Penny lived next door and is described as a 'proprietor of house(s)'. In 1871 Caroline was a draper's assistant in Leamington, Warwickshire. By 1881 Caroline was living with her mother in Somerton and is described as a draper/grocer. She married her second-cousin William Whittle (1837-1903) in 1885. 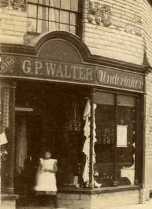 In 1891 Caroline and William Whittle had a nephew Fred Walters aged 11, born Glamorgan, staying with them. Could this be David's son? More about the Family of Caroline Walter and William Whittle. 5. Hugh Penny Walter aged 5 is listed in the 1851 census at Greenhill Farm. In the 1861 census he is working as a baker for Henry and Annie Priscilla Harris at Kilmington village (Mere District). Annie Priscilla was born in Foddington, Babcary and her mother was a Mary Walter (c.1798-1870) who married Edward Ings (1793-1850). By 1871 Hugh had moved to Llantrisant, Glamorgan, Wales - near his brother David. He was working as an iron miner and lodging with Mary Ann Knight (born in Bath, Somerset), a dressmaker at Tymawr. He emigrated to the USA (after his brother Robert) and settled in Barber County, Kansas. More about Hugh and Robert Walter in America. 6. Robert Leach Walter aged 15 is listed in the 1861 census at Greenhill Farm. He emigrated to the USA in the early 1870s, landing in Philadelphia and moving to Illinois, then Missouri and finally Barber County, Kansas. More about Hugh and Robert Walter in America. 8. Edward Jacob Walter aged 12 is listed in the 1861 census at Greenhill Farm. Edward Jacob married Eliza Gillett (1843-1925) at the Presbyterian Church, Cheltenham, Gloucestershire on July 21 1874. 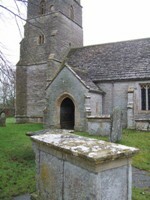 More at The Family of Jacob Walter of Cheltenham and Reading. 9. Susanna Walter aged 20 is listed in the 1871 census in Babcary described as a governess and living with Ann and Walter Walter and brother Gaius. She married George Philip Hayes (a.1857-1920), a hotel-keeper and later draper and clothier, originally from Ashcott, Somerset but living in Glastonbury in 1886. More about The Family of Susanna Walter and George Philip Hayes. Barber County Index April 17 1907 - Philip Walter, who is in the employ of the government in Queensland, Australia, is here visiting his brothers, Hugh and Robert Walter. Mr. Walter thinks the climate is fine, and may conclude to locate here if he can dispose of his Australian interests. FUNERAL NOTICE. THE FRIENDS of the Late PHILIP WALTER, age 89 years (late of Garbutt), are respectfully informed that his remains were peacefully laid to rest in the New Cemetery on WEDNESDAY AFTERNOON, 19th Instant. The Funeral moved from the Salvation Army Hall, Sturt Street, City, at 4.30 O'clock, Adjutant McCoomb officiating, with Band in attendance. A Memorial Service will be held in the Salvation Army Hall, City, NEXT (Sunday) NIGHT, at 7.30 o'clock. McKIMMIN & RICHARDSON (PTY, LTD.), Funeral Directors, A. F. D. A. Phones: Day 1231; Night 1688. 11. Gaius Penny Walter is detailed on The Family of Gaius Penny Walter and Mary Adelia Carter of Somerton and Southsea.